Orange County Mayor Teresa Jacobs welcomed hundreds of real estate professionals to the Global Real Estate Conference at the Rosen Shingle Creek Resort. 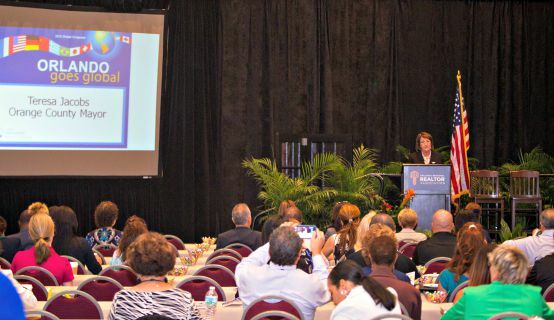 The goal of the conference, hosted by the Orlando Regional Realtor Association and the Global Real Estate Council of Orlando, was to highlight global real estate trends and educate Central Floridian real estate professionals on how to do business with current partners, including Canada, South America and the United Kingdom. Florida is currently one of the major U.S. destinations of international residential real estate buyers, with approximately 25 percent of property purchases occurring in the state. Mayor Jacobs commended attendees for their attention to global trade and travel since the relationship between tourism and trade are intertwined. With record-breaking visitation numbers in 2014 of 62 million visitors, Orange County’s visitors significantly impact the region’s economy, culture and import-export markets. Conference speakers included Orange County’s top economic development and trade-development partners Jerry Ross, Executive Director of the National Entrepreneur Center; Sean Snaith, Ph.D., Director of the Institute for Economic Competitiveness at the University of Central Florida; Phil Brown, Executive Director, Orlando International Airport; Rusty Roberts, Vice President Governmental Affairs, All Aboard Florida; Dean Asher, Regional Vice President, National Association of Realtors; and Dave Porter, Senior Vice President, Economic Development Commission. Photos from the Global Real Estate Conference are available on Flickr for use by the media.